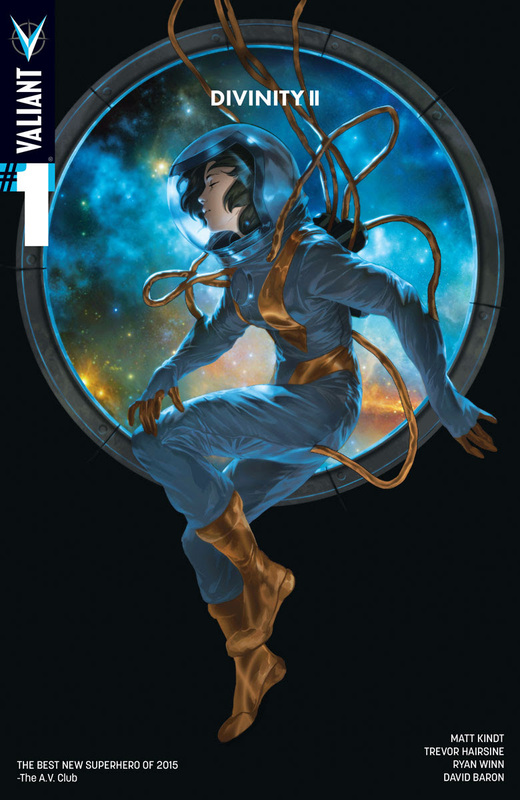 Fangirl Review: Valiant's DIVINITY II #1 Sells Out, Returns with Second Printing on May 25th! Valiant's DIVINITY II #1 Sells Out, Returns with Second Printing on May 25th! Plus: Your First Look Inside DIVINITY II #2 – In Stores the Same Day! After 11 sold-out printings in 2015, the next chapter of Valiant's acclaimed sci-fi saga has arrived…and it's already on track to become Valiant's next smash hit! Valiant is proud to announce that DIVINITY II #1 (of 4) – the long-awaited VALIANT PRESTIGElimited series from New York Times best-selling writer Matt Kindt (4001 A.D., Dept. H), Valiant-exclusive superstar Trevor Hairsine (X-Men: Deadly Genesis), explosive inker Ryan Winn (X-O MANOWAR), and acclaimed colorist David Baron (BLOODSHOT REBORN, The Authority) – has sold out at the distributor level and will return on May 25th with the DIVINITY II #1 (of 4) SECOND PRINTING VARIANT! Now, Myshka, the female co-pilot of the group, has also returned to Earth…but, unlike Abram, she had no secret family. Unlike Abram, she still believes in the Communist ideal. And, unlike Abram, she intends to play a very real role in the return of Soviet glory. Find out on May 25th with the DIVINITY II #1 (of 4) SECOND PRINTING VARIANT – in stores the same day as DIVINITY II #2 (of 4)! Jump on board here to find out why fans and critics are heralding the coming of DIVINITY II as one of the year's most visionary new series.